Many people are surprised to hear that for years we had no Japanese help at all. NOW, we DO have a Japanese secretary who helps out once a month. She’s a secret secretary. Our students don’t know we have Japanese staff. Why would we do that? We feel that if we have Japanese staff answering phones and dealing with students, it will lessen OUR connection with our students. It’s named Dave and Amy English school for a reason. It’s OUR school. The first person new students speak to and meet is Amy. Amy’s Japanese is not perfect, but it is fine for issues dealing with the school. And on the rare occasion, she does not understand what the student is asking about, then she will ask our ninja secretary to contact the student to clarify. Amy and I know everything about our school: how students are progressing, what lessons are best performing, how teachers are interacting with the kids…. Our ninja secretary is not a teacher. Her English is excellent, learnt in the country clubs of North Carolina socializing and playing tennis with leisured American ladies. But when it comes to school stuff, she hasn’t a school. 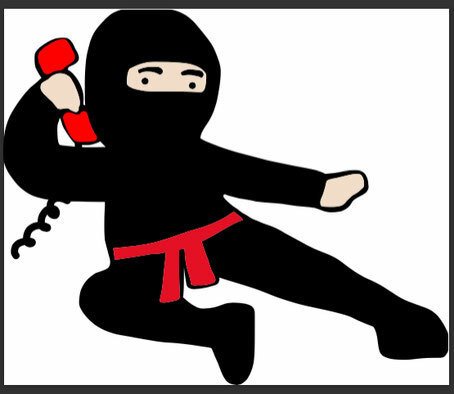 Amy would rather deal with ALL student issues herself—-only deploying our ninja secretary to handle particular difficult situations. For a brief period, we had a Japanese secretary known to our students. It was a disaster. Students would complain to her about trivial things. We never heard these complaints when Amy answered the phone. Our focus on teaching excellent lessons started to be distracted by banal issues that never existed before. We really didn't have the time or patience to deal with it, so we quietly let go our Japanese employee. I have heard similar complaints from Japanese who run their own schools. If Moms know you speak fluent Japanese, you will have students calling/ e-mailing about classroom trivialities such as so 'n' so kicked my daughter beneath the table, or my daughter prefers another teacher etc. Moms now email or call about essentials only: make - up lessons, class time changes… They write or call in Japanese and Amy will reply in Japanese and simple written English. We don’t get complaints about this. We think Moms and Dads enjoy English e - mails! So, now, we have one invaluable Japanese assistant for all our clerical issues and the occasional direct contact with a student. She is our ninja secretary. If you are wary of opening your own school with rudimentary Japanese, don’t be. If we did it, so can you.